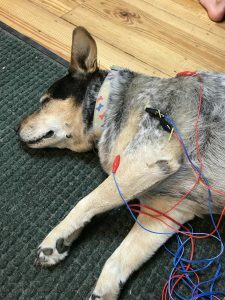 Abstract: Patty was treated with acupuncture during her recovery post-surgery for a traumatic injury to her left forelimb. Mobility had improved during recovery from surgery but significant lameness had continued and improvement had plateaued during recovery prior to starting acupuncture treatment. Patty was treated with acupuncture approximately twice weekly. Improvement in mobility and musculature in affected limb was noted throughout treatments although significant lameness persisted. 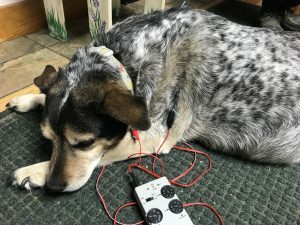 History and Presentation: Patty is an approximately 9-year-old spayed female heeler mixed breed canine that was taken in as a foster dog approximately 6 months prior to presentation. History prior to 6 months was unknown since dog was a stray. Patient was obtained as an obese dog with a large pedunculated soft tissue mass on her left hind limb that did not seem to cause dog pain or greatly restrict mobility. 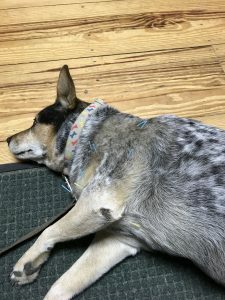 Patty had been run over by a vehicle and treated surgically for a humeral fracture by another veterinarian approximately 10 weeks prior to presentation for acupuncture. The surgery involved placement of a humeral intramedullary pin and biopsy of the hindleg tumor. Histopathology on the hindleg tumor indicated a benign growth and the foster care/owner has the mass scheduled to be removed once the patient is ambulating well on the healed front limb fracture limb. Recheck on the fractured limb approximately 3 weeks prior to presentation revealed a broken pin that has not moved so was left alone. Significant osteoarthritis was present in the left elbow joint. Dog is eating and drinking well with normal urination and defecation. Dog goes on daily walks on farm where dog lives. Current medication is 100mg carprofen daily. Physical Examination and Clinical Assessments: Bright, alert, responsive, friendly, obese patient with multiple soft subcutaneous masses on body. Large, approximately 6” diameter pedunculated subcutaneous mass on left tarsus/metatarsus with central superficial ulceration approximately 2cm in diameter with no discharge (from biopsy obtained 2 months prior). Mucous membranes are moist, capillary refill time is less than 2 seconds. Mild tartar on teeth with moderate wear on most teeth, gingiva normal. Mild to moderate lenticular sclerosis bilaterally. Haircoat normal. Left front lameness, weight bearing, grade IV/VI. Left scapular muscle atrophy with firm subcutaneous thickening around left elbow (most significant medially). Limited flexion of left elbow with mild to moderate pain. Atrophy of left triceps and biceps. Decreased flexion of left carpus with moderate pain. Mild myofascial restriction noted on both sides of neck with decreased flexion of neck laterally. Other limbs palpate with normal range of motion and no pain. Medical Decision Making: Neuromodulation of the nerves affecting the left forelimb to control pain along with stimulate use of atrophied muscles on the limb through use of acupuncture and electroacupuncture is a good option. Neck pain can also be targeted through use of acupuncture. Patient also would likely benefit from addition of gabapentin (started patient on 300mg PO q12hr in addition to carprofen patient was already on) for nerve pain associated with injury and chronic pain from osteoarthritis. Targeting of cervical vertebral 5 nerves through thoracic vertebral nerves 1-3 as well as local and myofascial trigger points along the left forelimb are indicated. Laser treatment (if available) would likely also be a good option to assist in further healing in the injured limb. Differential Diagnoses: Osteoarthritis of left elbow secondary to trauma and limb muscle atrophy. Osteoarthritis likely in left carpus but pain may be secondary to compensation due to proximal injuries in limb or to brachial plexus compression. Nerve injury to left forelimb secondary to trauma affecting scapular musculature, triceps. Acupuncture Treatments: 8/17/18 Initial treatment of dry needling only to gauge patient’s tolerance for treatment. Plan to target central areas on C5-T1-3 as well as some local areas on neck. Started with 0.2 x 30mm Seirin needles GV 14 and Bai Hui (autonomic nervous system) and central along with GB20 bilaterally. Left sided LU1, LU5 to target shoulder and elbow pain (cervicothoracic spinal nerves and radial/musculocutaneous nerves), LI15 for shoulder joint pain, SI9 to target axillary and radial nerves affecting shoulder, SI11 and SI12 to stimulate suprascapular nerve and atrophied muscles, PC3 for median nerve, TH14 (suprascapular nerve) shoulder pain, TH10 for (radial nerve) elbow pain and triceps tendon, LI11 as anti-inflammatory as well as lateral elbow pain. Treatment was done for 20 minutes. 8/22/18 Second treatment with 0.2 x 30mm Seirin needles for GV14, Bai Hui along with LU1, LU5, LI10, LI11. Used a smaller 0.16 x 30mmg Seirin needle for LU7 as a more peripheral point and to target any carpal pain. Used 0.18 x 25mm Carbo needles for LI15, HT3 for medial elbow pain and to target the ulnar nerve, SI9, SI8, SI11, SI12, GB21. Treatment was done for 25 minutes. 9/3/18 Dry needling with 0.2 x 30mm Seirin needles at GV14, Bai Hui, left side SI9, LU5, SI12, LU1, LU7, LI10, LI11, PC3. Carbo 0.2 x 15mm at SI11, SI12, SI8 for 25 minutes. Electroacupuncture SI9-LU5 and SI9-SI12 for 10-15 minutes at each location. 9/9/18 Dry needling with 0.18 x 25mm Carbo needles at GV14, GB20 bilaterally, SI11, SI12. Seirin 0.2 x 30mm needles at LU1 and LU5. Seirin 0.18 x 30mm needles at SI9, TH10, TH14, and Bai Hui for 30 minutes. Electroacupuncture from SI11 to SI9 and TH14 to LU5 for 30 minutes. Outcomes, Discussions, and References: Patient was tolerant of all treatments and seemed to have most relaxed response when electroacupuncture was used on affected limb to the point of falling asleep and snoring. Mild improvement in left elbow mobility along with significant improvement in left shoulder/scapular muscle hypertrophy was noted during the course of the treatments. Severity of lameness in the left forelimb was not significantly improved throughout treatment time period. Plan is to continue acupuncture treatments weekly after patient has large hindlimb mass excised. This case has encouraged me to incorporate electroacupuncture as soon and as much as possible as the most positive response during treatment seemed to come from use of this modality.